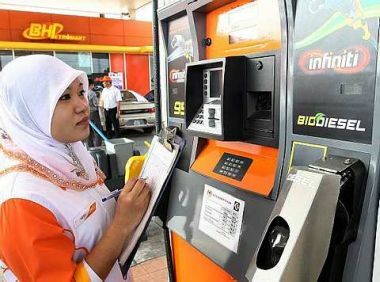 PUTRAJAYA, Sept 2 — The price of RON95 petrol and diesel will go up by RM0.20 per litre from midnight, Prime Minister Datuk Seri Najib Razak announced today in a move to rationalise subsidies. Najib, who is also the finance minister, added that the 1Malaysia People Aid (BR1M) will be raised from the current RM500 in Budget 2014 to better direct financial aid to the needy. RON95 petrol will be priced RM2.10 per litre and diesel RM2.00 after the hike, up from RM1.90 and RM1.80 respectively. “We hope sellers will not take this opportunity to increase the price of goods without taking care the interests of the people,” Najib told reporters after a Fiscal Policy Committee (FPC) meeting here, describing the effect of the hike as “minimal”. The decision today was made as part of Putrajaya’s move to consolidate its fiscal position, and reduce the federal government current account deficit-to-gross domestic product (GDP) ratio to 3 per cent by 2015. “Currently, our subsidy system benefits everyone, including the higher income group and foreigners. Thus, we need to move to a more targeted subsidy system that caters for the vulnerable groups,” Najib added. The price hike will reduce fuel subsidy of RON95 petrol to 63 sen per litre and 80 sen per litre for diesel. Previously, the total fuel subsidy allocation for 2013 was recorded at RM24.8 billion. Najib promised to increase the amount of BR1M handout as a way to reduce the burden of the low-income and vulnerable groups resulting from the price hike, and pledged a comprehensive social safety net over the longer term. Besides the two announcements, Najib also announced that public sector projects will be considered carefully, giving higher priority to projects with low-import content and high-multiplier effects. However, certain projects such as the Mass Rapid Transit (MRT) will continue as planned, while the Kuala Lumpur-Singapore high-speed rail project is still being negotiated. In conjunction with Visit Malaysia Year 2014, Putrajaya will also be looking at diversifying its export market through tourism. Najib however declined to comment on the proposed 4 per cent Goods and Services Tax (GST), which was mooted as a much-needed remedy to trim the deficit, saying it will be discussed in full when he presents Budget 2014 to Parliament to be tabled next month. The prime minister also stressed the need for a healthy current account balance, especially after global ratings agency Fitch Ratings revised Malaysia’s sovereign debt outlook from “Stable” to “Negative” last month. “The market will feel more confident if we’re able to bring down our fiscal deficit. That is why it is important for us to ensure we’re on track to fulfil our commitment,” said Najib. The last time RON95 petrol and diesel’s prices were hiked was in December 2010, from RM1.85 per litre to RM1.90 and from RM1.75 to RM1.80 respectively. The price for RON97 petrol was last increased in May 2011, from RM2.70 per litre to RM2.90. Malaysia’s fiscal deficit has already widened to RM14.9 billion, and runs a relatively high government debt of 53 per cent of GDP in addition to one of Asia’s highest household debt levels.